This week, everyone having anything to to do with mobile and wireless are gearing up for the coming CTIA Wireless Association event, which is scheduled for March 21-23 at the Orange County Convention Center in Orlando, Fla. This week, CTIA announced the show will consist of 40,000 representatives from 125 countries and more than 200 exhibitions. Most events begin at 9 a.m. and run all day, and a full three-day schedule is available on the CTIA Wireless events page. How can someone register for the CTIA Wireless events? Anyone can register for the CTIA events online or at the door. At-the-door registration begins at 8 a.m. and lasts until 5 p.m. each day of the show. Only Standard, Onsite pricing is available, whether registering online or off. Prices range from $185-$2,199, depending on how much access a person wants to the events. What are some of the most notable events scheduled? Money Over Mobile: This is probably one of the more important events at the CTIA this year and will be held at the Pre-Conference event on March 21. Mobile payment systems are just now becoming popular, and everyone is jumping to get a piece of the action. This CTIA event jumps on the "Mobile Money and Banking" trend and features representative panelists from PayPal Mobile, Citi, Chase/JP Morgan, Visa, Nokia, The SmartCard Alliance, VeriFone, and many others. Mobile Web & Apps World Forum (March 21): CTIA is this annual applications and mobile web showcase's home, and this year's theme is "The Rise of Mobile Social Commerce." This year's keynote speaker is David Williams, from AT&T Interactive. Also attending are representatives from the PayPal X Developer Network, OpenPath products, RealNetworks/Gamehouse, Impact Mobile, MTV, and many others. FierceWireless Presents: The Path to 4G (March 22): The focus of this event, hosted by the FierceWireless editors, will be to look where the industry goes from "here" in 4G technologies. Verizon will give an LTE status report, and other panelists will include representatives from Clearwire, AT&T Mobility, Sprint, GSMA, 4G Americas, and others. The Future of Tablets (March 22): Known as iPad and Tablets in San Francisco, this event, sponsored by EVRI, is an encore presentation that will discuss how tablet PCs are taking over the industry and why they "are the future of commerce, publishing, and advertising." Other topics will include business models, research trends, design, development and deployment, revenue models, content conversion, tablet app stores, and much more. 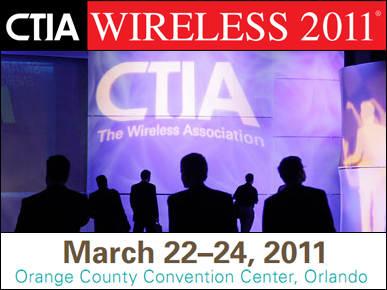 Tower Technology Summit 2011 (March 22-24): This event, hosted at CTIA since 1997, will cover all aspects of wireless infrastructure with a dedicated exhibit floor Pavilion. Focused events include conferences about mobile video, WIMAX, wireless backhaul, and anything that focuses on wireless. CTIA Big Idea! Wireless Contest: This contest's five finalists will have a chance to present their Big Idea! Submissions on March 22 and three winners will be announced at 2 p.m. USA Today's Ed Baig will present the winning Big Ideas at the Exhibit Innovations Stage at 3 p.m. and again on March 23 at 11:30 a.m.
CTIA E-Tech Awards Ceremony (March 23): The year's awards ceremony, CNBC's Jan Fortt will present 14 winners with an Emerging Technology Award (E-Tech Award). Additionally, the Best Online Pick, and Best of Show will also be presented at the ceremony, which will be determined by online and text votes. The ceremonies will take place at 2 p.m. at the Exhibition Innovations Stage.